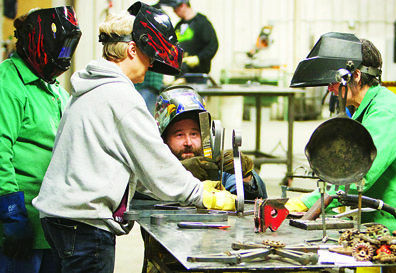 An all women welding class in Cut Bank, Montana, is creating a bit of local buzz this month, according to the Cut Bank Pioneer Press. Their name? The Arc Angels. Their mission? To have fun. The Arc Angels are a group of about a dozen women who meet every Tuesday night for about 2 or 3 hours in the Cut Bank Schools’ bus garage. While there, the ladies weld everything from plant stands and picture easels to yard art and wall decorations. LeAnne Kavanagh, another member of the class, which jokingly refers to itself as “Old Lady Welding”, recounted her own welding adventures to the Pioneer Press. “I used the plasma cutter to make a heart-shaped metal bulletin board of sorts and then went to town using the scroller and welder to make a trivet and easel. I also made a couple of crosses out of railroad ties and metal tubing, and some fun metal desk art. The women were encouraged to bring project ideas to instructor Brian Hayes to ensure they had the right supplies. Remember, most of these students were using wire-fed welders, plasma cutters, benders, rollers, cut-off saws and other equipment for the first time. The class humbly began as a ladies ornamental welding class offered by Cut Bank School District No. 15’s Adult Education Program, before it developed its nicknames. Instructor Brian Hayes helps Arc Angels Shirley Gage, Shelley Larson and Joyce Lewis line up the legs on their plant stand before securing them with the wire-fed welder. Hayes said the first thing the class covered was safety and basic welding skills. After that, he asked whether the women would rather focus on learning more about welding or working on projects. They opted for projects and dove right in. And that enjoyment is what makes the Arc Angels so endearing to its members. For these women, welding isn’t about a technical skill. Welding is about relaxing and having fun. The Arc Angels held an art show and silent auction scheduled on March 15th. 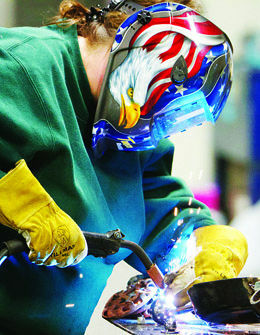 The show featured the Arc Angels’ work, as well as projects from some of Hayes’ high school welding students. In addition to giving the Angels a chance to show off their creations, the money from the show went to the equipment for Cut Back Schools’ vocational education shop. The donation is the class’s way of showing their appreciation to Hayes and to the school district. So what happens when the class is over? Some of the Angels want it to keep going, and It looks like some may be looking to improve their skills as well. Shortman is hoping that Hayes will teach a beginner’s class and an advanced class next year. “And, of course, I’d sign up for both” she told the Pioneer Press, chuckling. If you’d like to advance your own skills, we invite you to check out the many resources available on our website: http://awo.aws.org. There you can find online courses, blogs, podcasts and more to help improve your knowledge, skills and career. 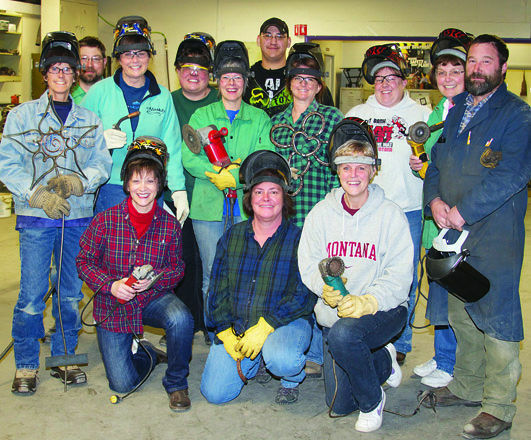 And if you’d like to read more about the Arc Angels and their “Old Ladies Welding” class, check out the full article “Sparks are flying in ‘old lady welding’” by Lind Bruch of the Cut Bank Pioneer Press. I am a woman welder too.. I am trying to find a job here in New Mexico but, willing to relocate anywhere except Colorado. I am very interested in getting to know you all so I can where my life goes from here as a welder. Love what you do as a welder and want to find out more about you ladies.